The device runs on Android 7.0 (Nougat), On Camera, it has a 13-megapixel rear camera with LED flash and a 5-megapixel front camera. It also comes with LG Pay, the company’s own payment solution. It has an aluminum back with fingerprint sensor below the camera. Packed with a 3000mAh battery. It has military grade durability with MIL-STD-810G that can withstand impact, vibration, high temperature, low temperature, thermal shock, and humidity and also has a dedicated digital to analog converter (DAC) for Hi-Res 32-bit 192 kHz audio listening. 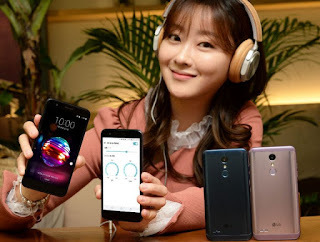 LG X4+ comes in Moroccan Blue and Lavender Violet colors, is priced at 300,000 won and will be available through all the three major carriers in Korea later this month.